Two Buck Chuck wins wine competition. With gas prices up, railroads are getting more competitive. I like that. The "poor and disenfranchised" Brit terrorists. Yup. Two of them were MDs. Driscoll. Count on the NYT to ignore facts to make the story fit "the narrative du jour." Michael Yon's latest: A grim visit to the Baquba suburbs. Soldiers dancing with kids in Iraq. If you could put Newt's brain into another personality and another body, he'd be a great candidate. Tennessee clean-up: Messy front yard lands lady in jail.�You ain't seen a messy front yard til you've seen a messy Tennessee front yard. Miss Hoosegow 2007. Vote early and often. LaShawn on black pride, school integration, and liberal paternalism. In his most outspoken remarks on Islamists, the former Prime Minister warns that Britain is in danger of losing the battle against terrorists unless mainstream society confronts the threat. Blair�s remarks, in which he also attacks some civil liberty campaigners as �loopy loo�, were made in a Channel 4 documentary recorded last Tuesday on the eve of his departure from Downing Street. �The idea that as a Muslim in this country that you don�t have the freedom to express your religion or your views, I mean you�ve got far more freedom in this country than you do in most Muslim countries,� Blair told Observer columnist Will Hutton, who presents the documentary. Wow--what if our president said that? It'd be an earthquake! NJ, did you mean for the Soros link to go to Lashawn? Woops. Will fix when I have a minute. "Seemingly arcane historical disputes can often cast a powerful light on the state of our collective soul. It is for that reason that I like to read books on obscure subjects: they are often more illuminating than books that at first sight are more immediately relevant to our current situation. For, as Emily Dickinson put it, success in indirection lies." ...read elsewhere that the Viking longboat replica is 100' long, with a 12' beam, and yet draws only just over a meter of draft. I forget the displacement--but whatever, that's a mighty shallow draft. 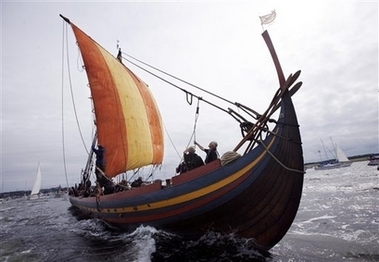 Good boat for many tasks--but jeez, can ya imagine a north Atlantic storm in such a craft? I was coasting down NJ's list and my cursor automatically clicked on the soldiers dancing with the Iraqi kids. That was so cool. Wow. Good pick, NJ. Buddy - Have a agree with you about the longboats. I studied/taught them when we did the Vikings, and I can't remember now if they had outrigging for storms. I know they buried their leaders in mounds and put those longboats in there. Sometimes they sent them off to sea loaded with riches. There was probably a rogue band of Vikings on the nearest lee shore waiting for Old Laars and his gold.